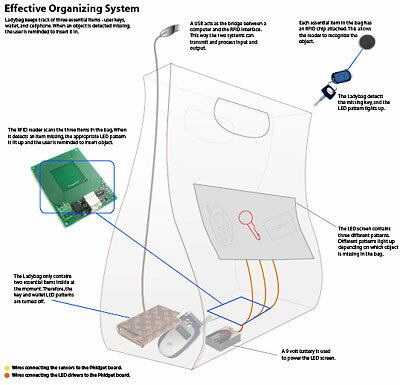 Step One: Hire Team Ladybugs, a group of six students from the School of Interactive Arts and Technology at British Columbia’s Simon Fraser University, to further develop their prototype Project Ladybag Effective Organization System (EOS). Step Two: Convince them to develop their purse technologies for men’s bags instead of just women’s, and to allow the EOS to recognize a much broader array of gadgets. What’s Project Ladybag? A series of experimental handbags enhanced with sensing technologies and RFID. Yeah, we’re cringing at the name too, but we like the idea behind one of the bags, the EOS: A screen on the purse exterior shows a picture of missing items. When you’re ready to go out, just glance at the outside of the bag, and it tells you what you need to remember to take with you. To design the purse, the students used off-the-shelf technology. Into the bottom of the bag they embedded a radio frequency identification reader, which is powered by a nine-volt battery. They wired the reader to a screen-like panel in the front of the bag, which contains three patterns of light-emitting diodes. Each pattern is an icon representing an essential item that the owner does not want to leave home without. In the prototype, these items are a set of keys, a wallet, and a cell phone. Lastly, they attached an RFID sensor to each of those items. As long as each item is missing from the Ladybag, its corresponding icon lights up. As the keys, phone, and wallet are each placed into the tote, the icon blinks off. “I always forget my phone, but always remember my handbag. This is a great solution,” said industrial designer Rosanna Kilfedder, a master’s degree candidate at Heriot-Watt University in Edinburgh, Scotland. Documents at the Project Ladybag website indicate that testers had some difficulty getting the prototype to recognize contents as they were inserted, but that the Ladybuggers are continuing to refine the design. But we see a much more interesting market for their innovations in the world of men’s gadget carriers. Imagine: contents recognition for all the items you carry with you in messenger bag, your shoulder bag, or — best of all — your (now not-so) hidden cargo shorts. This entry was posted on Tuesday, May 2nd, 2006 at 7:30 am	and is filed under Bag Contents, Electronics, Gadget Bags, Man Purse Technology. You can follow any responses to this entry through the RSS 2.0 feed. You can leave a response, or trackback from your own site.